I was a vegetarian for 10 years and during that time, I hankered for meat. I didn’t really give in, but when I’d walk through my neighbourhood and smell steaks sizzling on balcony grills, I’d get envious. The smell of bacon didn’t do it for me, but the scent of summer grilling was enough to make me bonkers with meaty desire. Those vegetarian days are long past now, so I can happily indulge in a once-in-a-while summer barbecue. 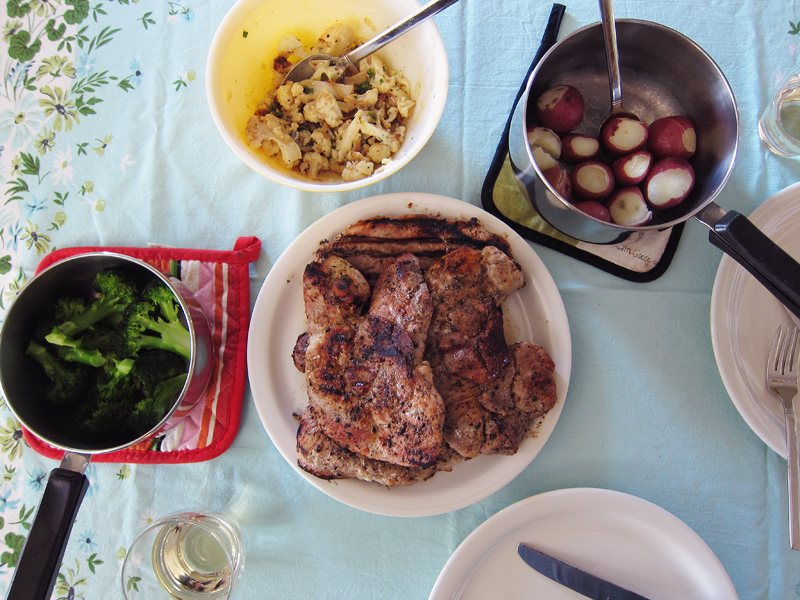 Last summer we inherited our in-laws old gas grill – hello grilled meats! I had never grilled pork chops before, but when a sale at our local friendly butcher shop enticed me to buy four chops, I decided to try it out. Brining seemed like the best way to keep the meat tender and flavourful, so that’s what I did. 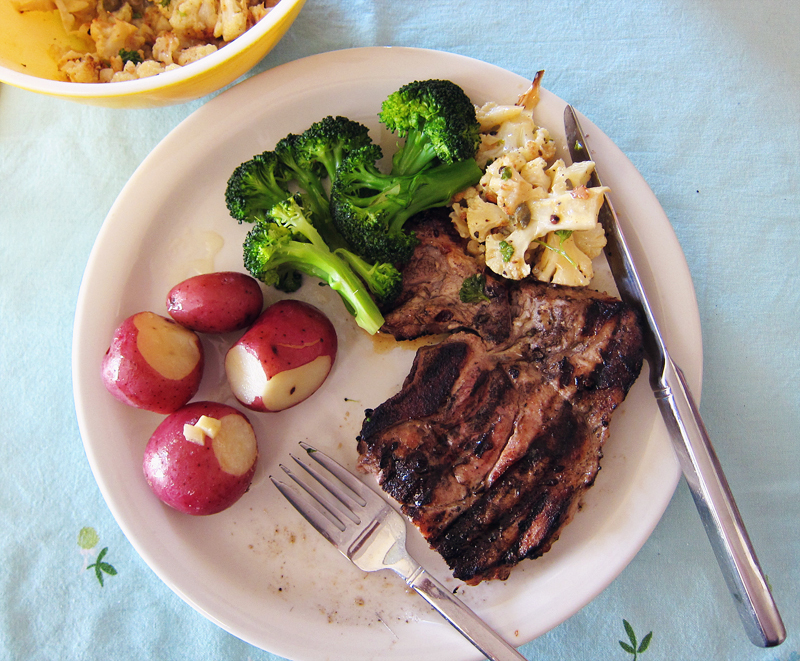 And it’s easy too – just a little advance prep and you can be eating the best grilled pork chops of your life. True, I might be prone to exaggeration, but man, these were some seriously tasty chops! Dried herbes de provence, a couple of bay leaves, star anise, along with brown sugar and salt and you’ve got the cure for bland pork. I’d suggest a 2 hour minimum soak, but you can marinate overnight as well. Since I first made this recipe, I’ve tried both a short soak and a long and either way, you’re in for a tasty dinner. The only other pork chop grilling tidbit I’d like to share is to let your meat rest after grilling. The same goes for steaks. I grill the pork to an internal temperature of 145F – some now say that 135F is fine, but I’m a wimp and prefer not to risk anything. Just use a meat thermometer and you’re golden. Also, go for thicker cut chops, rather than quick fry ones! Juiciness and flavour are your goals. In a medium sized saucepan, combine the brine ingredients and bring to the boil. Let mixture cool. Refrigerate until cold. Add in about 1/2 a tray of ice cubes to the mixture or add 1/2 cup ice cold water. Pour the mixture into a large sealable plastic bag or a tupperware tray and add in the pork chops. Let marinate for at least 2 hours or overnight. Heat up your bbq and bring up to 400F. Remove the chops from the bag, drain and pat dry the pork chops. You may choose to Rinse the chops before patting dry, but I never do. Sear the chops over direct heat, about 2-3 minutes per side. Slide the chops over to the part of the grill where there is indirect heat and cover. When the internal temperature reaches 145F, remove from grill and let rest under aluminum foil for 10 minutes. Don’t skip this step as resting is all part of getting the juices through the meat and relaxing the fibres. Or something. But whatever happens, it sure makes the chops super delicious. Serve. Your meal looks awesome! Too bad I’m not your neighbour! I’ve had many of bland & tough pork chops in my lifetime mainly because I don’t take the time to do anything to the meat. Generally, I season the meat with salt/pepper/oregano and throw it into the oven or on the grill. Sometimes when I plan my meal in advance, I may even marinate meat (maple syrup/mustard) but I’ve never tried brining. I wonder if this would work with ribs? I have a rack of ribs on the freezer and I was wondering if I should just add a dry rub or go full hog (pun intended!) and marinate for several days or even brine? Thanks Joanne! Come be our neighbour (the apartment below is will probably sell in the next year or two 🙂 Brining is great for chicken and pork, but for ribs, I’ve never tried it. I do have a good dry rub recipe here for ribs: http://everybodylikessandwiches.com/2012/08/super-tender-dry-rubbed-ribs-with-a-sweet-spicy-barbecue-sauce/ So you could try that! 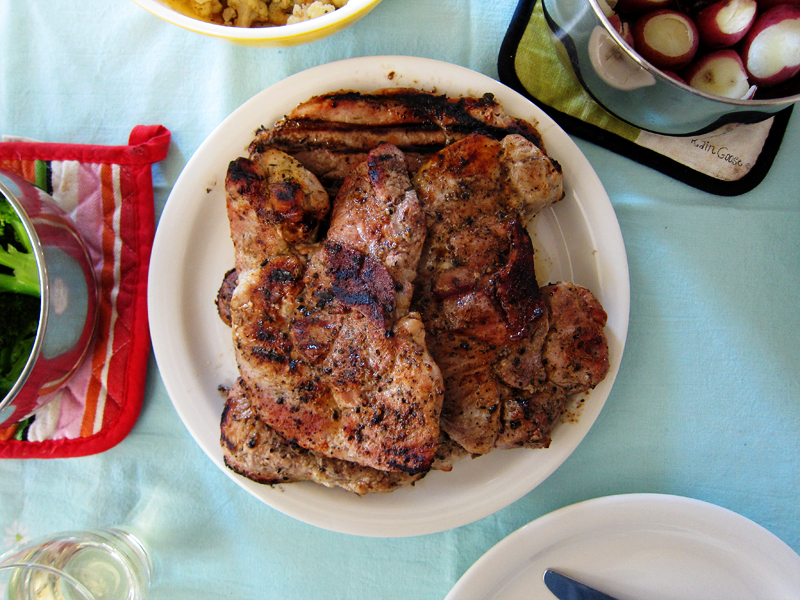 I’ve never brined anything before, but we had pork chops & decided to use your recipe. I didn’t have star anise so I left it out. Delicious! Laura, I’m glad that it tasted great without the star anise! Funny reading your comments about giving up being vegetarian… I didn’t eat meat for over 5 years and it was my brother in law’s chicken barbeque that did it for me. I just fancied one bite and a whole skewer later. Is it that distinctive charcoal smell or taste maybe? Thanks for the fantastic recipe and grilling instructions! The pork chops came out great! Demelza, glad you tried this out, hooray! !